I lost an awesome friend over the weekend. funny, gregarious, interesting, dynamic, strong, loyal, and so sweet. She was one of my earliest women's club friends. I bonded with her from the very first meeting. She had that kind of magnetism; was liked by everyone. I am sharing a pic of the first time I had her for tea. 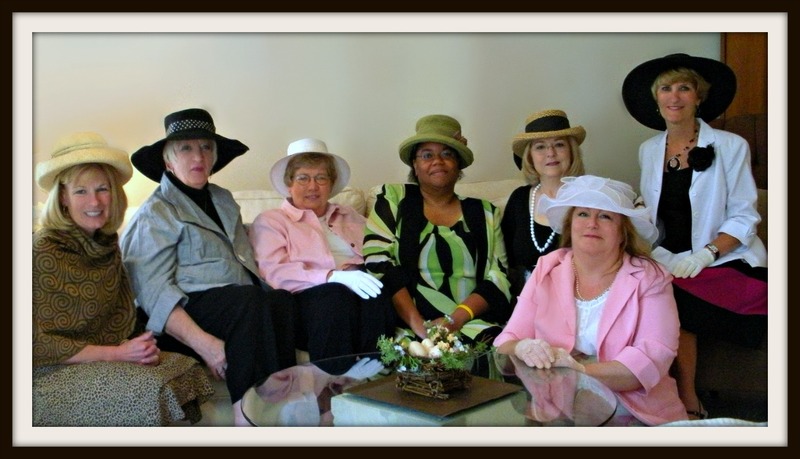 She is the one 3rd from the left in pink and black. but had a nephew she adored, and many many friends. and always had such fun stories about life there. she was having trouble walking. and found out she had brain cancer. I tell you, friends, she was upbeat and brave till the very end. she has gained my eternal respect. May she rest in peace until the Second Coming of the Lord! and for those who are mourning this loss, as they are many. who needs the healing of prayer for this loss. It's been hard on her and I know she really hurts. As always, thank you for your visit. so you can get to praying right away. That's what is really important here today. Red White Blue Wares & Giveaway!